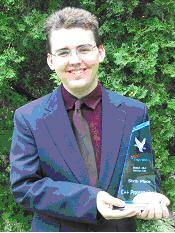 [JULY 22, 2004] DENVER -- Tim Wiser, a freshman at Lincoln Community High School, was honored at the recent National Leadership Conference of the Future Business Leaders of America, a professional association for students pursuing business careers. Competing in the association's national awards program, Tim was presented with an award for sixth place in C++ programming. An honorable mention goes to Jillian Kimberlin, a senior at Lincoln Community High School. She competed in Word Processing II at the event. The awards were part of a comprehensive competitive events program sponsored annually by Future Business Leaders of America-Phi Beta Lambda. Individuals, state teams and local chapters are encouraged to compete in any of nearly 40 different events representing a wide range of activities and the business and leadership development focus of FBLA-PBL. The winners of these highly competitive and prestigious awards are selected from among the membership of 250,000 students and advisers and represent some of the best and brightest of today's youth. The almost 7,000 delegates to the National Leadership Conference participated in a structured, four-day meeting for each division, including business and leadership training workshops, seminars, corporate tours, and election of national officers. Future Business Leaders of America-Phi Beta Lambda is the national business education association that prepares students for careers in business and business education. Its members, belonging to more than 6,000 chartered chapters, include students from the United States, the Virgin Islands, Puerto Rico and Europe. Future Business Leaders of America is the high school division and Phi Beta Lambda is designed for postsecondary and college students. For membership information, contact the national headquarters at 1 (800) 325-2946 or visit www.fbla-pbl.org.